Some things are just meant to go together; milk and cookies, chocolate and peanut butter, bacon and well, pretty much everything! I’ve been wanting to make another quiche recipe for a while. I just love the way a quiche allows different ingredients to come together in combination with eggs and coconut milk to create unique and incredible flavor combinations. In my first forage into making a quiche, I created a recipe for Balsamic Vinegar Glazed Caramelized Onion, Bacon and goat Cheese Quiche. The recipe for it can be found here. As it turns out, by making this new recipe, I can add another group of foods that are definitely meant to go together, yellow squash, fried shallots and bacon. 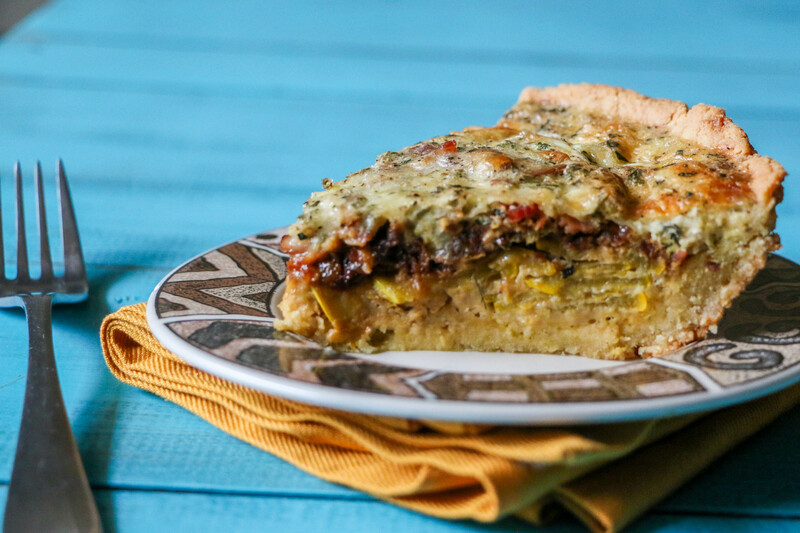 When I first came up with this recipe, I planned on using zucchini as the base of the quiche. In fact, the first two times I made this quiche, I used zucchini. However, when I went to the grocery store to buy the ingredients to make the recipe for the third time as part of my recipe development, I learned that the store hadn’t gotten in their daily shipment of vegetables that morning. In a fit of genius inspiration (and the fact that I didn’t want to go to another grocery store to shop for food), I decided to grab two yellow squash as a substitute for the zucchini. For most people, yellow squash and zucchini are interchangeable, and there isn’t suppose to be much, if any, type of difference is flavor. Therefore, I wasn’t to concerned about the swap. But when I used the yellow squash in the recipe, for some explainable reason, the flavor of the quiche turned out even better. I’m not sure if the difference in taste was psychological, or the grocery store had a really good shipment of yellow squash over the past couple of weeks, but the results of this squash swap turned out pretty great, if I do say so myself. I got third party confirmation of the better taste of this quiche from two of my friends, so my results are obviously steeped in heavy scientific research and are completely legitimate ;). This recipe calls for a pre-made pie crust. My go to recipe for a gluten-free pie crust can be found in Danielle Walker’s Paleo cookbook Against All Grain (one of my favorite cookbooks for amazing Paleo, Primal, gluten-free and grain-free recipes). There are many Paleo friendly pie crust recipes available. Check out this almond flour pie crust from Elena’s Pantry, or this recipe for a savory pie crust from the Grain Free Kitchen. 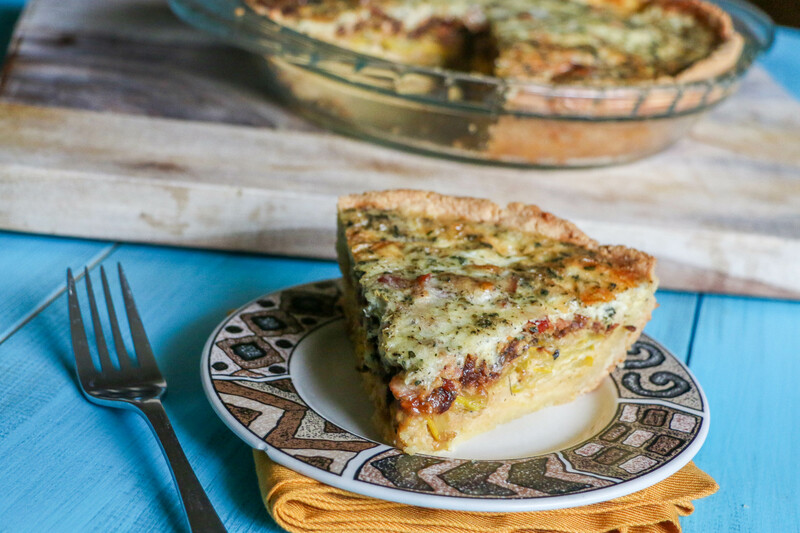 This quiche would be perfect for breakfast or dinner. I served this quiche alongside pan roasted asparagus, and it made for a scrumptious and filling meal. Please let me know your results in making this recipe by leaving a comment below. I really enjoy reading about your experiences in making the recipes I share! While the oil is heating, line two plates with power towels. Once the oil in the skillet is hot, add the shallots and fry for approximately 10-12 minutes, stirring frequently while they cook until the shallots begin to brown. Once the shallots have browned, remove the skillet from the heat, and scoop the shallots out of the oil on place on one of the paper towel lined plates in order to get rid of the excess oil. Once the shallots have drained and cooled, crumble them into smaller pieces and set aside. In a separate large skillet, add 4 slices of bacon. Place the skillet on the stove, and cook the bacon on medium heat until the bacon is cooked through to desired consistency (I like my bacon cooked just until slightly crispy). Remove the skillet from the heat, and place the bacon in the second paper towel lined plate in order to drain the bacon grease. Once the bacon has cooled, crumble the bacon into small pieces and set aside. Wipe down the large skillet used to fry the bacon, and place the skillet back on the stove over medium-high heat. Once the skillet has heated, add 1 tablespoon of butter to the skillet and allow the butter to melt. Add the minced garlic to the skillet, and sauté in the melted butter for 15 to 20 seconds. Then add the yellow squash to the pan, and continue to sauté the yellow squash and garlic over medium-high heat until the yellow squash becomes tender, approximately 5-7 minutes. Remove the skillet from the heat and allow the squash to cool slightly. In a large bowl, whisk together the eggs, Italian seasoning, salt and pepper. Add the coconut milk to the egg mixture, and whisk further to throughly combine. Add the mozzarella to the egg mixture, and stir to incorporate (if using cheese). Lay the yellow squash all along the bottom of the pie crust, making sure that the yellow squash is evenly layered. Next sprinkle the fried shallots evenly over the squash. Then sprinkle the bacon over the fried shallots. Pour the egg/coconut/mozzarella cheese mixture into the pie pan over the pie filling. Line a baking sheet with foil. Place the pie dish in the middle of the baking sheet, and cover the top of the quiche with foil (make sure the foil is tented over the quiche so that the foil does not touch the top of the quiche before it goes into the oven, or else the foil will stick to the top and be difficult to remove – learned that the hard way). Place the baking sheet with the quiche in the middle of the oven, and bake the quiche covered, for 45 minutes. After 45 minutes, remove the baking tray from the oven and take off the foil from the top of the quiche. Place the baking tray back in the oven and continue cooking the quiche for 15-20 minutes. Once it is done baking, take the baking tray out of the oven and let the quiche cool on the counter for for 5-10 minutes before serving. 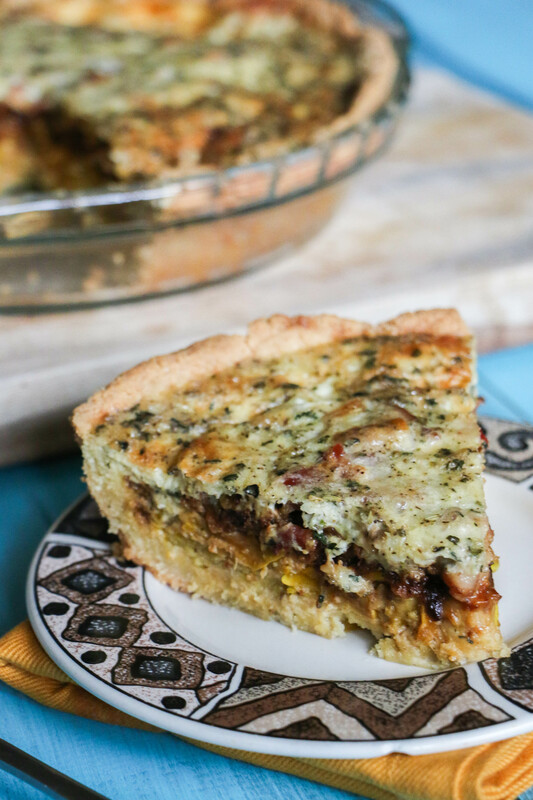 Tags: bacon, breakfast, breakfast ideas, fried shallots, Gluten-Free, grain-free, Primal, quiche | Permalink.